"Weird Al" Yankovic Announces "The Ridiculously Self-Indulgent, Ill-Advised Vanity Tour"
Fresh off his casting as the Oompa Loompas next month, comedy rock god "Weird Al" Yankovic will begin rehearsing for a "no frills" tour in 2018. 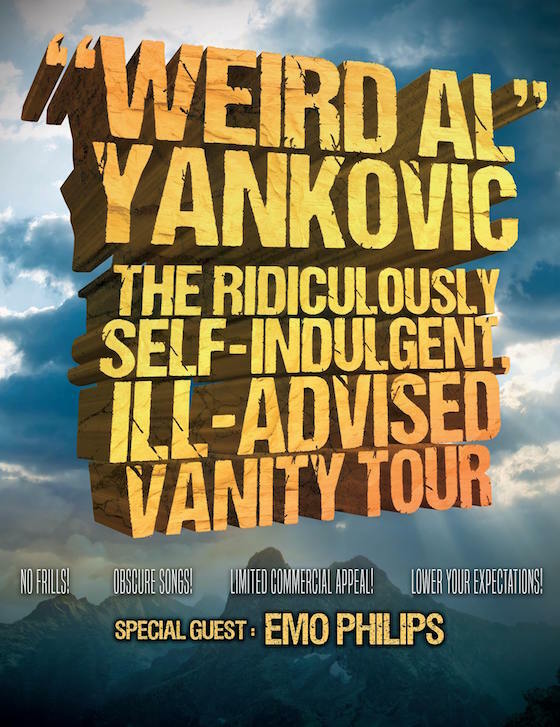 While frugal grocery shoppers might expect some unbranded mac and cheese from the "no frills" designation, what it actually means is that Yankovic will be performing rarities from his back catalogue on a trek called the "The Ridiculously Self-Indulgent, Ill-Advised Vanity Tour." He'll also be skipping the costume changes and video screens in favour of a stripped-down rock band setup. "After putting on 'multimedia extravaganzas' for 35 years, we just wanted to take it down a few notches and have a little musical palate cleanser," Yankovic said in a statement. Opening the show each night will be Al's long-time friend (and UHF cast member) comedian Emo Philips. The tour features plenty of Canadian dates, including Toronto, Montreal, Calgary, Regina, Winnipeg and more. Check out the full itinerary below, along with a trailer for the trek, and look for tickets to go on sale on October 20.